Last two weeks, in my free time, I was working on a system to automate Green house or an open field. The system designed using Arduino Nano and Raspberry Pi. The Arduino is used to read sensors and control devices and the Raspberry pi is the brain that decides what to do when an event detected by Arduino. All the systems communicates wirelessly via XBee. Switch on the drip irrigation pump when the soil humidity is low. Switch off when the soil is wet. Switch on the Main motor that connects to a water source when the reservoir level goes down. Switch off the main motor when the reservoir is full. If it’s a Green house then monitor the humidity and control devices to increase or decrease the humidity. Also need to control temperature. Below is a very ugly drawing I could come up : ), to explain the system. The nodes are connected to different Sensors like Soil Humidity, Temperature, Air Humidity, etc. Also the nodes can also switch on/Off drip irrigation motor, switch on/off Reservoir’s Solenoid valves, or control any hardware needed in the field. I developed this central/brain system in Nodejs. The system is very much generic and run based on configurations. So nothing is hardcoded. 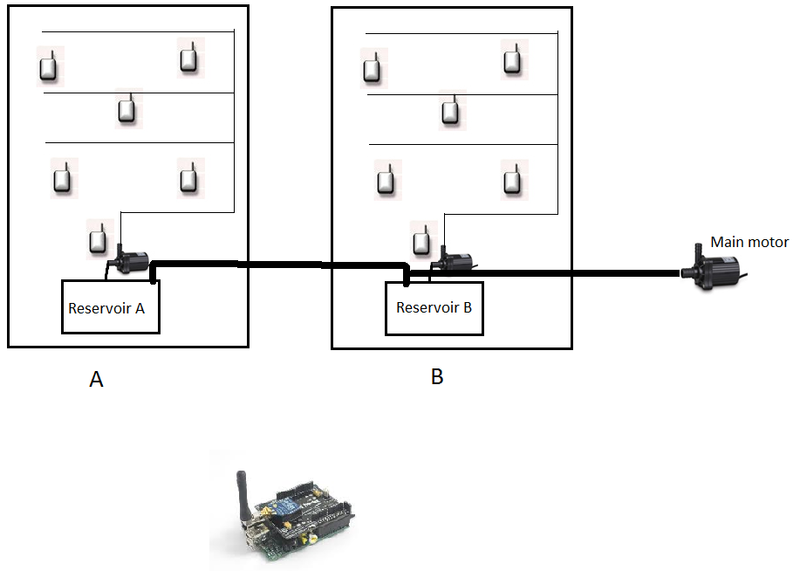 The XBee connected to the pi act as the coordinator and receive periodic sensor inputs from Ardunio connected in the field. This system can issue command to control devices based on the sensor inputs. Let’s go through some of the scenarios to see how the system works. Watering the plants: From the above picture you can see, there are 5 Arduino’s in the field sensing different parameters. For now lets think that they all reads the soil humidity. Say soil humidity value range from 0 to 100, where 0 is dry and 100 is fully wet. We need to switch on the drip irrigation motor when any of the sensor value is less than 20. Once all the sensor give a humidity value greater than 90 we need to switch off the motor. As you can see the system need to take action based on the values coming from the sensor. Depending upon the crops these values can be changed. That’s where the Central Node js system comes into play. In the central system, we can group the Sensor nodes and configure the triggering points. Also we can configure what to do when the triggering points reach. For e.g. in the above case we can say when the soil humidity of any sensor goes below 20, then send the Motor switch on command to the node sitting next to the Reservoir motor. To switch off the motor, the system needs approval from all the sensors, that means the motor will get switched off if all the nodes reported value is greater than 90. Failover: What happens when a sensor node dies without sending soil humidity greater than 90 value, will the motor run whole day? No, the central system can be configured for that too, while configuring we can set up a timeout period. If the central system is not receiving high water level after a configured time, it automatically sends a Switch off command to the desired Arduino node to switch off the motor. Filling Reservoir: From the above diagram, we can see there are two reservoirs and one Main motor. The main motor need to switch on to fill the Reservoir. Each reservoir is equipped with sensors to detect the High and Low water level. Also each water input is equipped with a solenoid valve. If the reservoir is high then the solenoid valve will close the input thus protect the reservoir from overflowing. Once all the reservoir get filled the system will switch off the Main motor before closing the last solenoid, other wise the pressure increase and can damage the Main motor. 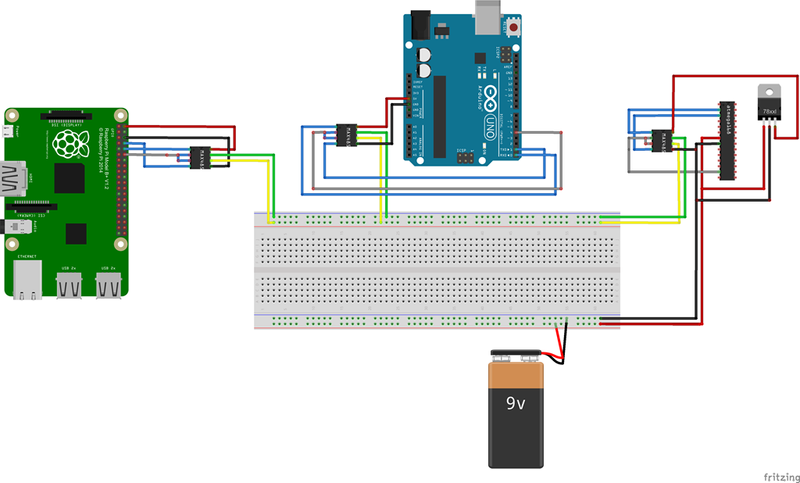 The Arduino node will send a Water low when the water go down below a desired level. Then the central system will open the Solenoid before switching on the Main motor. The valve will open only for the reservoir where the water is low, rest all the valves will be closed. If more than one Reservoir’s water is low then those valves will be open and the main pump will work until all the reservoir’s are filled. For e.g. say Reservoir A and B’s water level is low then both the valves will be open and switch on the main pump. A get filled and B is still not full then A’s valve will get closed. Once B is full the system will send Main pump switch off command then sends the command to close B’s valve. All the above scenarios are based on certain rules and all these rules are configurable. The central system is not aware of any rules. Based on the fields condition we need to configure it. User can also see the activities in the farm via a dashboard. I haven’t designed any Dashboard UI yet. Recently I was doing some experiments to establish a wireless communication between a Raspberry pi and Arduino. To establish wireless communication I used XBee Pro Series 2 from Digi International. The idea behind this test setup is to test, whether I can control devices like motor or read different sensors remotely. One of the biggest advantage of using XBee is, you can find a lot of tutorials and libraries for any kind of system and programming languages. For this test app, I used Node js in RPi and C in Arduino. XBee: I configured two xbee, one as Coordinator and another as Router. Both in API mode 2 (AP =2). I used XCTU to configure both the device. Only reason to choose API 2 is because the Arduino library I used only support API mode 2. Raspberry pi: connected Coordinator XBee to one of my RPi. You can see more about the connection in one of my earlier post. Arduino Uno: connected the Router xbee to one of my Arduino. The connection is pretty simple as below. This sketch uses a XBee library, to add the library, goto Sketch->Include Library->Manage Libraries. From the window search for XBee and install the library. I am using Arduino IDE 1.6.7. I use SoftwareSerial to establish serial communication with XBee, Pin 2 is Arduino Rx and Pin 3 is Arduino Tx. //buffer and creates unwanted results. //Send a packet every 4 sec. Burn the sketch to Arduino. Run node js code in RPi and you start receiving the frames from Arduino. In my searches, I came across a very elaborate blog about Raspberry pi and how to utilize this small computer for development purpose. Also the post touches topic about how to configure Port forwarding to access the Pi from Internet. I was thinking about how to control my Aeroponic system remotely via internet. The Raspberry Pi controlling the system is connected to internet via a router. I could access RaspberryPi by Port forwarding and stuff like that but it’s complicated. Next option could be using Websockets but I felt it’s an overkill for the applications running in Pi. Recently I received a Refcard from Dzone regarding a protocol called MQTT. I was not aware of this Protocol before. So thought of doing some experiment with it. I am not going much deeper into the protocol, Dzone refcard did a great job of explaining it well. In a nutshell, MQTT consist of three parts. Publisher, publish message to a specific topic and any Subscriber subscribes for that topic receives the message. 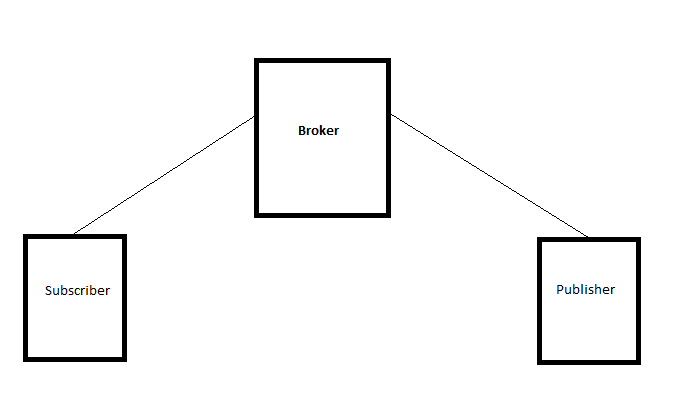 Broker is the central hub, both Publishers and Subscribers are connected to the Broker and it take care of delivering the message to all the subscribers subscribed for the topic. We can implement our own broker using RabitMQ or Mosca plugin for Node js or any other MQTT brokers available in the market. To experiment it, I used CloudMQTT addon in Heroku. I used Heroku just to manage every thing from one central place. I created two set off Node js application, one running in my computer as a publisher and another running in my RaspberryPi as a subscriber. Both have no direct connection instead they are connected to CoudMQTT broker. Below is a test code and nothing related to my Aeroponic system. The above code act as a Publisher as well as a Subscriber. For e.g. the above code can be a piece running in Internet and the Pi’s can Publish the Temperature readings in a periodic interval and logged in a central db. 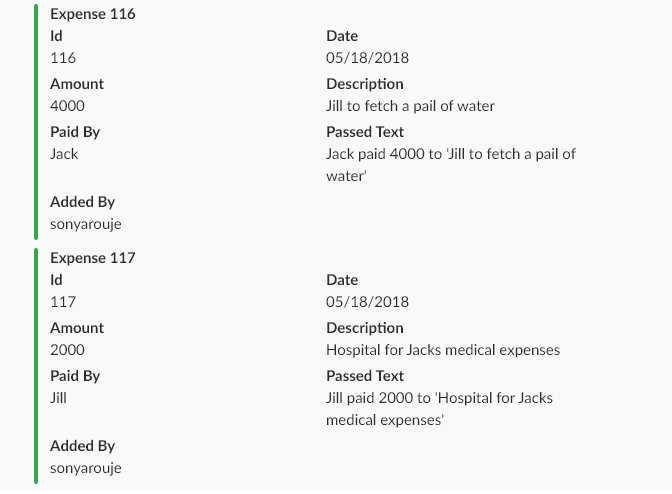 We can see the readings via a webapp or which ever the way we need. Also if required we can set a temperature to all the connected RPi’s by publishing a message to topic ‘SET_TEMPERATURE’. The code is very minimal and we could achieve an easy communication to all the connected devices. In the above scenario clients are always connected. If you want to end the connection then call ‘client.end()’. Later I implemented a Broker using Mosca, both scenarios the system worked really well. We are in the age of connected devices, devices could talk each other either via RF or wired. In one of my post I explained about Radio Frequency communication using Xbee. In this post lets see how devices can talk each other via wired network. One of the advantage of Wired network is, it is cost effective compare to buying an XBee modules like Xbee pro. I personally prefer Wireless communication as it’s hassle free, just place the devices where ever we need. In my previous post I explained how to Bootload Atmega16A and program it using Arduino. Next step is to establish the communication between the Micro controllers and Raspberry pi. In this case my Raspberry Pi is acting as the central hub that talk to other controllers and collect data or issue command to do some job. I better leave it to Wikipedia to give a detailed explanation of the protocol. In brief using RS485, devices can communicate Full duplex or Half duplex. I used a Half duplex communication. So it’s a protocol, how do we implement the protocol in our hardware, there is a chip Max485 from Maxim. This chip can establish a half duplex communication. Max 485 is a 8 pin chip as shown below. It’s a DIP chip and SMD have different pin layout. Pin 1 – RO: It’s the Data-In pin, devices can read data from the bus using this pin. Rx pin of the Micro controllers should connect to this pin. RE and DE: Set this pin to Logical High to transmit any data to the bus. Set this pin to Low to receive data from the bus. Pin 4 DI: Devices can transmit data via this pin. This pin should be connected to the Tx pin of the device. Pin 8 and 5 – VCC and GND: To power the chip, VCC should be 5 volt. Pin 7 and 6 – A and B: Here we connect the data line. A should connect to the A Pin of the next Max 485 and B with B. The below picture will illustrate how to connect all the devices together. As per the diagram, if RPi want to transmit any data. We should set a high voltage on GPIO 18 and issue a serial write. All other devices in the network will be in listening mode and can read data using serial read, if any other device wanted to transmit data, then issue a Logical High to RE DE pin and will get promoted as a master and transmit data via serial write. Now it’s up to you to program it and do some cool things with it.